1 3/8" = 35mm Wide woven fabric genuine leather belt. Nickel brush buckle with a single prong and a leather stitched on loop. 5 Holes for easy fit adjustment, stitched on buckle and a double stitched all around the belt for better support. 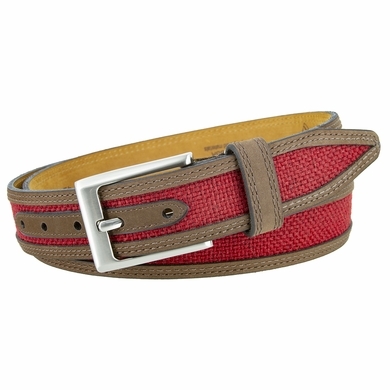 Perfect eye catching red fabric and leather belt for a casual or dressy look to complete your outfit.